28 km north of Lyndhurst is the ghost town of Farina, now nothing more than a fascinating collection of ruins with the surrounding countryside littered with old drays, wheels and rusting pieces of equipment. It is strange, while wandering around the ruins, to think that people once made their homes here and hoped to grow wheat in the parched surrounding landscape. The area was originally proclaimed a town on 21/03/1878 and called “Government Gums” because of the mature River Red Gums in the creek to the north of the town. Later it’s name was changed to “Farina” (Latin for wheat or flour) by farmers who optimistically hoped to turn the vast flat lands here into fields of grain. For a few years the rains were unusually good, and the farms and town flourished, reaching a population of about 600 before the copper and silver mine closed in 1927. At its peak the town had a bakery, grain store, two breweries, two hotels, a general store, post office, Anglican church, five blacksmiths and a school. Then the normal climate returned … bringing years of drought and dust storms which eventually forcing the abandonment of the town. Farina was the railhead from Port Augusta from 22/5/1882 until 1884 when the line was extended first to Marree and then Alice Springs. The line closed in the 1980’s and was removed in 1993. Railway buildings included platforms, goods shed, sheep and cattle yards, station masters residence, workman’s cottage and a 5m gallon reservoir. One of the more unusual cargoes embarked at Farina railway station was South Australia’s biggest meteorite. The 1.2 ton Murnpeowie iron Meteorite was dragged out of the desert north-east of here about a century ago; and can be seen today at the South Australian Museum in Adelaide. Afghan camel drivers lived on Afghan hill, on the eastern side of the town. They brought in wool from the stations and delivered supplies to them. Chinese came to Farina as construction workers on the railway and some stayed on as gardeners. 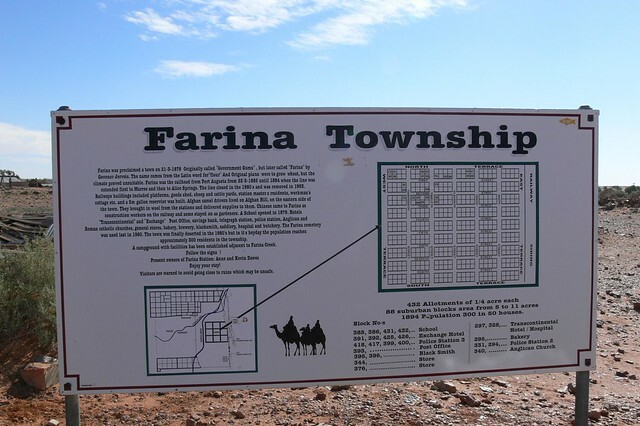 The Farina cometary was last used in 1960 and the town was finally abandoned in the 1980’s. A bush camp ground with facilities has been established adjacent to Farina creek by the owners of Farina station. You wonder what kind of life’s the people had that lived in the homes that now lay in ruins. Who their where and where did they go in the end, where they happy or sad? 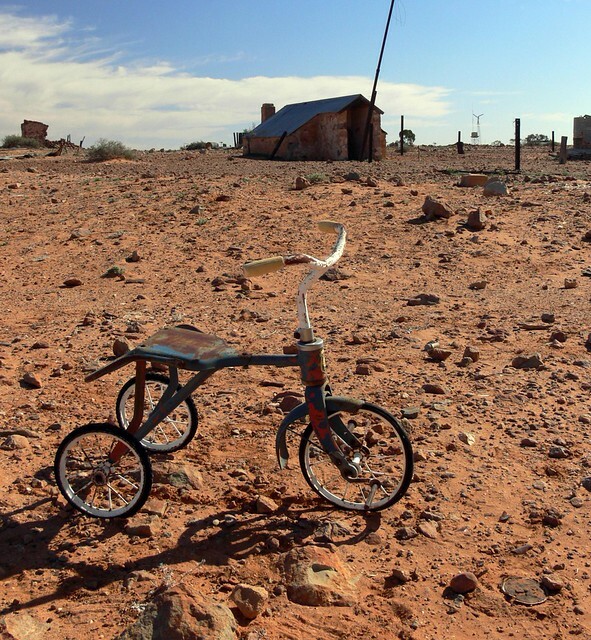 …and I thought Coober Pedy was a ghost town! Those are chilling pictures. Puts me in mind of Mad Max. Interesting information. Thank you for sharing it with us. This really makes me thing how there’s so many other places in the world that was once populated and now it is deserted..Its great to have people out there to research these places and tell us the history. I’ve visited Australia 5 times and had no idea it had places similar to the place you’ve reviewed in this post. There is a lot of interesting facts one can learn about different lands! Great site! Great post. There’s just something I love about ghost towns. In the states, I love visiting North Dakota for that reason – just stumble into some places where these tiny towns and churches have been abandoned for years. There’s something endlessly fascinating about that. Good post! 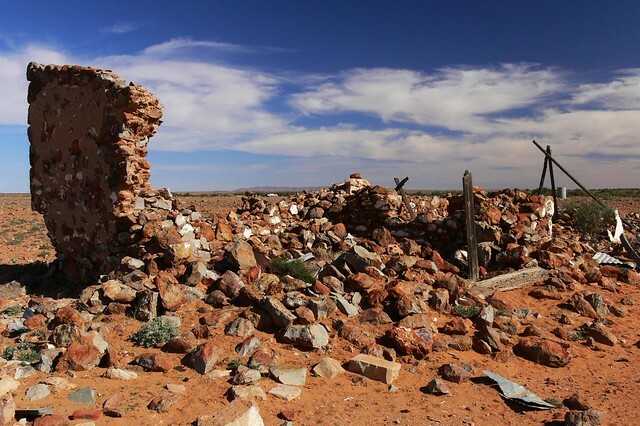 Australia, and especially the Outback, is such a great place to visit ghost towns, lonesome bush towns that had an interesting history. I always imagine how it must have been in the early days without modern day’s transport. I am fascinated by the history of the old ghan railway line. Thanks again for sharing th photos and the stories. I’ll sure be back to your blog. That tricycle reminds me a little bit of The Shining. The place looks as dry as a bone. I don’t know why they thought they could grow crops at any time. The Farina Campsite is a little valley of greenery amongst the saltbush. Finding desolate places, especially where you don’t expect them to be, is quite inspiring. Finding out that people in a remote place LIVED and DIED there long ago gives me a very strange feeling, but one that I like. I hike in the black hills and finding old mines and stuff sunk into the hills is amazing. Word of warning: DO not enter these structures! Touching anything can bring the whole thing down on you. A group of people interested in Farina history and the restoration of some of its buildings is conducting a working program from 3rd May to 17th May 2009 and would be keen to hear of interested people who would like to be involved (not necessarily for the full time). could not ride a bike for the life of her but could ride a camel with ease. Thank you for the photos of the town. have camped many many times in september to watch the rainbow bee eaters burrowing in the creek bank to breed and watch young whiteback swallows huddling together on the power wire behind the ‘donkey’.unfortunately i havent been since my dear companion left this earth. The last time we were there was in a dust storm and a group of lutheran people were going to the territory for a centenary celebration and they stayed in the old shearing sheds down the creek. she was very sick but loved every moment of the storm proped up in the back of the old hilux and it was in the mid30s overnight without complaint. legend has it the optomistic town folk joked that the next two towns should be called bran and pollard, as their town Farina was latin for flour. My greatgrandpa was a resident carpenter and block owner at sliding rock where I visit regularly and so i was drawn to Farina and Maree while visiting the ‘old carpenter’. never feel more at ease than when i am in this countryside. Hello, I am researching family history for McPharlin. the Name Bernard McPharlin and his wife and family are all listed in this area, which include Saltina and Pich Richi. I have deaths noted of this family in these areas but am unable to find cemetaries in these areas. This is the last part of the family that is unfound and would love to know a bit more about them. just love the pics. of Farina, so haunting. According to our family history, my Grt. Grandmother was the first white woman born in Farina..I have a diary she wrote in later life, which tells of her childhood in Farina. Also there is supposed to be a grave in the Farina cemetery of a relation but I haven’t been able to verify.does anyone know of any Adams in local cemeteries?? around that time. Will be visiting Farina around 27th April this year. Trevor, If you are going to Farina, would you be able to have a look and see if there is a grave of a Jane Adams.I was told it was on a hill(?) by a tree at the farina cemetery. I would live a photo of it, if possible. she is part of our family, and I will never be able to go there, so if you can help I would be most grateful. Hello all, Farina is where my relatives once lived…a long time ago….We are trying to find out about these people, how they lived etc…..I was wondering whether any of you out there have seen of heard about the McPharlin families , or found grave stones etc. Thanks Trevor, really appreciate it.. Hope the trip is not too hard for you…elaine.. The Farina Restoration Group which is made up of volunteers will be working at Farina for the month of May. The renovation of the Cemetary incorporating an information pergola, plus the building of a memorial to those who served in WW1 & WW2 (incorporating an information pergola) are high priorities. On the weekend of the 22nd/23rd there will be a “Back to Farina”. The underground bakery will be operational, there will be a cricket match on Saturday and entertainment in the woolshed on Sat night, and on Sunday the cemetary upgrade will be consecrated and there will be a dedication of the war memorial. Please refer to web site http://www.farinarestoration.net for more information about the Restoration Group. We would welcome more interested people. Hi Trevor, just wondered if you were back from your trip to Farina….I am just about dying from curiosity to know whether you found out any info for me, about the grave site???? Hi Elaine, Yes back from the trip to Farina, sorry for the delay in contacting you. It was a tremendous trip but unfortunately I could find no reference to your inlaws. Not to give up though as the owners of Farina station are in the process of researching the graves at Farina,apparently most of the local records were lost in a fire but fortunately in that era records of births and deaths were registered at Burra. After the rains at Farina things are in a bit of a mess (roads and such) but the countryside is in excellent health, the greenest i think I have ever seen it. We coulnt drive to the cemetery,roads washed out, but we hiked and took a few photos which I will send as soon as I work out how to. Could find no trees or evidence of any anywhere near the cemetery. A lot of unmarked graves that are being investigated. The Dawes family at Farina station are a lovely family and were very helpful to us and are very dedicated to the research of Farina history so dont give up the ghost yet-more is happening. Sorry again and will post photos of cemetery asap. Discovered Farina over the past two days by accident. What a find. Spent hours wandering around, taking photographs, soaking up the History. And you don’t need a “bloody great big 4 x 4” to get there. Take some tucker tho. Congratulations to those who look after Farina and the super “ripper you beaut” camping park. Well done to you all. We will be back ! Looking for any info or photo’s about the Hisgrove family or the Adams family from Farina..If anyone has any photo’s I would love a copy….Hope to get there one day…. My Great Grandma Edith Adelia Riley was born in Farina 13 Sept 1882 , her parents being Charles (William) Riley and Idealia Jesse (nee Campbell born in NSW) . I believe she went to school there as a young girl but after leaving school the family moved to Adelaide. Somewhere between Farina and Adelaide she had a ‘relationship’ with an unknown male which produced a daughter born in Adelaide 1907. The daughter was my grandmother. There are a few photos of Farina on the web – http://trove.nla.gov.au/picture/result?q=farina sa amongst them one of a group of school children at Farina school ca 1898 which may be of interest to the group. I was lucky enough to remember her but unfortunately never really asked many questions about her childhood, and never found out that my grandmother never knew her father until after she passed. I too am interested in anyone who may have access to any information, school or cemetery records from this era just to help me complete the family ‘story’ . I am interested in my family tree. I note in the cementry the surname Kite also comments from Daisy Kite aged 93 (not a bad innings). I can always remember my mother (Rhonda Florence nee Waters) talking about this area and the stations. My father who has just recently died did make and repair camel saddles. I know he worked for many years as a fencer around these areas. As a child I remember visiting Quorn to see my grandparents. My birth certificate states Father, Leigh Creek Station via Copley, he was a station hand. His name was Malcolm Howard Kite. I was estranged from my father at 3 years of age. I lived at Farina My mothers family was there from the very early days My grand father died there in 1930 I am Interested in and collect any thing from Farina this article from the Adervertiser will be of interest to you.I also have a connection to the Kite Family. Mr. Stephen Kite, an old and highly respected resident of Farina, died on Wednesday last after living there for 31 years. He was born in Wiltshire on February 16, 1838, and arrived two years later at Holdfast Bay in, the sailing Ship Rajahstan, thus being a colonist of 74 years. His family first settled at Hindmarsh. He married in 1865 Matilda, daughter of Mr. Barnard McPharlin, of Saltia. The following year he went to Blinman with teams and carted copper ore to Port Augusta, later on taking taking a contract to cart poles for the overland telegraph line as far as Peake station, about 350 miles north of the Blinman. a big thank you to Bill. The information you sent is great and I will be using it for sure. I wish to contact Gayle from above as I have a photo of Nathaniel Finn grave and would like to communicate. My ancestors – BAKER,HILL,WHITE, MURTON etc have connections to Farina,Blinman areas. From memory some of my ancestors were married I believe at the residence of a William FINN. This is my very first effort at finding out something about my paternal family. I don’t know how I got to this site, but am blown away with the information you are providing each other. My cousin and I have wondered all our lives (63) about our Father’s family, no one seemed to have anymore information regarding dad and his 6 brothers and 1 sister being born between 1900 – 1921 my dad being the youngest. I have in the last couple of days been told a Thomas Evans and Margaret Anne Gregory (my grandparents) were married at the Residence of a Mr Dawes in Farina in 1900. Would love to hear from anyone with info from that time period. Most of my Aunts and Uncles were born in Beltana one in Oodnadatta. Also Elaine No. 25 . I have information of Thomas Gregory (b1849) marrying Mary Ann Hisgrove including photographs wondering if this could be of any help to you? Hi Karyn….Elaine 25 was my sister..she passed away in February from cancer..We were doing research on the Hisgrove and Adams family’s from Farina..any info you may have would be great.. I am happy to send you my email address if that is easier..My Gt Grandmother was a Hisgrove born in Farina…probably a sister to Mary Ann hisgrove…We planned on going to Farina but my sister never made it…i am still planning on going with her daughter some time soon….any photo’s would be great…..I am in W.A. It is gratifying to see the level of interest aroused concerning Farina. The Farina Restoration Group (Campers and Caravanners from all across Australia, over four programs, have expended 15,000 volunteer hours ,collectively,some 130 persons have been involved. 2009 thru 2012. Labelled –A “Ghost Town” – Ghost Towns don’t talk; so we now consider it to be an Historic Inland Township,representative of many similar sites that are reduced to piles of rubble.. We are “lifting” Farina out of that status and it now well and truly tells its own story. For help in our next stage I need a Photograph of the building which was the Farina Hall It was located on the Pattersons Store/butchers site -adjacent to the Bakery. Can you help…Tom. am enjoying the exchange of information about our ancestors time at Farina, My (and my cousin Kevin O’Brien) great grandfather Francis O’Brien was Railway Foreman for the railhead (which was the end of the line for the Ghan at that stage) and for the Northern Region, based at Farina from 1881 to 1889. He lived there with his wife Catherine (nee Driscoll)and a heap of children. He was involved in many bridge and line washouts via storms and floods, etc. In fact, as mentioned in a previous message here, my grandmother Catherine (their daughter) was born there is 1883 approx. Kevin has some photos of various buildings there, including the hospital, where we guess she was born. We have found a newspaper clipping from the SA Register in 1889 which records the formal function to farewell Francis and the family from the area, and thank him for his efforts. He then went to Port Wakefield. We are both fascinated by the interest in this small, forgotten place, and plan to visit in the not too distant future. If anyone has any connection to Francis, Catherine, their family or their friends, would be pleased to hear from you. Hi Karyn, Yes Leah Julie Hisgrove is the one I have been looking for…I would love a copy…She committed suicide by taking stricnine..Do you know who the people are in the photo’s…Where did you get them from, are they meant to be family??? I would love a copy of Mary Anne..My Gt Grandmother was Charlotte Hisgrove….. Anyone else that may have info on Adams or Hisgrove family I would love to hear from…. Miss the Flinders and surrounds. To everyone trying to find family history, DO NOT give up. Someone will eventually discover something of significance. I know because it happened to me. Have a look at the web page South Australian History.com.au/Farina. This has a link to Farina cemetery. Nic Klaassen who was a teacher in Leigh Creek has done a lot of Research on South Australia. I am the baker that re-commissioned the underground bakery in May 2010 as a way of raising funds for the Farina project. Along with all the volunteers I get enormous satisfaction from my involvement. Whilst not a spiritual person, whilst onsite I am constantly reminded of the people who lived here by virtue of working in their space. Whilst operating the bakery you cannot help but consider what it would have been like 130 years ago. During this years stint a few of the volunteers uncovered (removed tonnes of red dust) from the black smiths shop. This went from a routine role to one of immense excitement as they began uncovering wagon wheels, springs, tools and all sorts of other objects perhaps last touched by the black smith himself. The desire to souvenir artefacts from the site may be tempting but we urge all visitors to please take only photographs. We even had a group drive into the middle of The Exchange Hotel and set up a picnic which was very arrogant and ignorant of those people that wish to take photographs while passing through. The amount of history that this project is drawing out will certainly answer many questions for those people wishing to explore their family trees. My husbands descendent John Green was the owner of the Exchange Hotel at Farina – he passed away August 2nd 1907, aged 55 years and is buried at Farina. I would love to have any information at all regarding his time there. He was married with children. We are travelling to Farina hopefully in the next few weeks to reminisce and would be nice to talk to someone with the history at their finguretips. Is the Exchange hotel being restored? Pat. I hope to visit Farina soon, my grandfather Leslie Keith Finn was born there, parents were William David Finn and Ethel Ellen Edwards. John Edward Finn was my grandfathers Uncle from what I can find out. My grandmother Edith Finn was from Farina. I have several photographs, one taken by a group of people who were ex residents from there. Her father Natahaniel Finn was a camel driver who also carted telegraph poles. I ahve a photo of William David Finn. Contact [email protected] you would like a copy. Hi all, I’m jared Martin, my family has a lot of history in and around farina. My fathers mother was born in farina. I have been doing a lot of research in regards to a story that my father is apparently aboriginal. But from what I can gather he is mostly English. My fathers grandfather was Edward ‘Ted’ Stephen Kite and his wife Bettsy née Johnson, I was told that somewhere along the lines of kite and finn family lines was an aboriginal connection. The reason for my search is my father Jeff has many characteristics of an aboriginal and my sister had a strange birth mark that the doctor said was only found on those with an aboriginal connection. Any pictures or stories related to the martin’s , kite’s or finn’s would be great. Wow accidently Discovered this page and some amazing history – THANKS! Desperately looking fro any information (other than Trove that I have already) on the MCCABE’s, my partner is their descendent of James (Jim) McCabe, family was there from mid 1895 – early 1920’s that we can confirm, but little other info other than his father (also James) was a Teamster who lived in Farina and worked at Mt Lyndhurst Station and Murnpeowie and Mt Fitton, one of their sons Thomas did the mail run north till the 1930’s? They are all buried at Willaston down my way, but the family stories and history are missing so very much (even when they arrived in Australia and went to Farina. Hello to all the Finn descendants. I am the grand daughter of Richard Maxwell Finn, son of William and Ethel Ellen Cains Mills Finn. William’s was the son of Nathaniel and a blacksmith by trade. My grandfather was on of 16 children, there were 10 boys and 6 girls. Allan as a 14/15 year old was working with a drover north of Maree. He got lost in the desert country which he was feared dead. He was found by nomadic aboriginals nearly dead and lived with them for 2 years. Allan was returned to his family. He was a great stockman and bush tracker. In the 1930’s, the parents and some of the younger children moved up to Boula Qld. The family lost their possessions to fire just before WW2 and then they moved to Townsville. William Finn died in Townsville just after the war and Ethel moved back to Adelaide to live with one of her daughters and died in Adelaide. My name is Allan Finn, my father was born at Farina and his father was William Finn and his wife was Ethel Ellen Edwards. My father has told of some stories about Farina and his family who lived there. I would like to get to know anyone who have any family contacts to the Finn clan as I am interested in any one who are relatives to the Finn family.